Hundreds of current and future workers within Greater Philadelphia’s growing maritime industry will have access to specialized training programs under an initiative announced today by Citizens Bank, the Collegiate Consortium for Workforce and Economic Development, PhilaPort and Philadelphia Works. Representatives from the four organizations gathered at the Packer Avenue Marine Terminal in South Philadelphia to announce the creation of the Citizens Bank Regional Maritime Training Center – a first-of-its-kind workforce development initiative that will provide formal, enhanced training opportunities such as forklift certification and recertification, yard jockey training and OSHA safety training. The center is being funded through a $100,000 contribution from Citizens Bank and a mix of public and private funding sources. 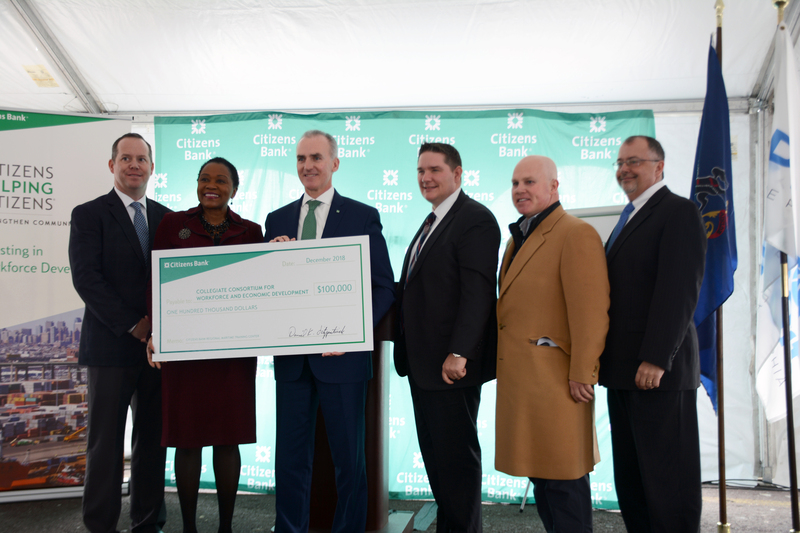 The Citizens Bank Regional Maritime Training Center will be located at a former PhilaPort-owned overflow facility at 61st Street and Essington Avenue in South Philadelphia. Initial funding will support the purchase of a portable classroom trailer, line striping on site for obstacle training, heavy equipment rentals and purchase of palletized mock cargo for applied training. Partners estimate 200 new and existing workers will take advantage of the center’s programs during the center’s first year of operations. The Collegiate Consortium for Workforce and Economic Development, which includes Bucks County Community College, Camden County College, Community College of Philadelphia, Delaware County Community College, Montgomery County Community College and Drexel University, will develop curriculum for training at the new center. Philadelphia Works, the city’s workforce development board, will help fund and oversee training services at the center, as well as support grant writing for additional public and private funding. The Philadelphia ports serve one of the most densely populated areas in the country, with approximately 27 million people located within 100 miles. PhilaPort is the independent agency charged with managing and maintaining port facilities along the Delaware River in Pennsylvania and is a critical partner in this initiative. The Citizens Bank Regional Maritime Training Center is expected to begin providing programming in 2019. Established in 1994 as the Shipyard College to provide education and training to displaced workers of the closing Philadelphia Naval Base and Shipyard, the organization initially was comprised of three area community colleges (Delaware County Community College and Community College of Philadelphia in Pennsylvania and Camden County College in New Jersey) and one university to leverage the region’s expertise in various areas of training. Several years later, the organization was renamed to its present moniker and expanded to include two additional community colleges (Bucks County Community College and Montgomery County Community College in Pennsylvania), bringing the total to five community colleges and one university. This collaboration of institutions of higher education serves the needs of regional employers to upgrade the skills of incumbent workers as well as to provide training to new hires. To date, over 20,000 area workers have been served. Philadelphia Works is the city’s Workforce Development Board, investing in solutions and services to grow Philadelphia’s economy by connecting employers to workforce talent and career seekers to jobs. We influence the public policies that support economic growth, and optimize funding and resources to invest in regional solutions to build a skilled and thriving workforce.